You can buy fruits, vegetables, grocery, electronics or just anything that is available locally ... these items will be delivered to you at your home ! 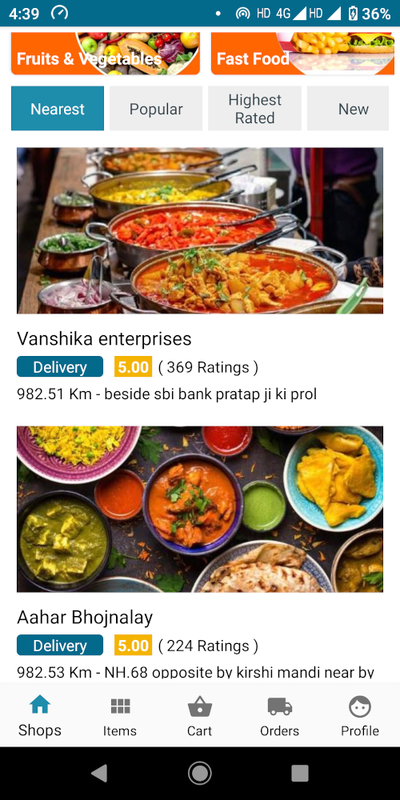 Nearby Shops helps people buy items like fruits, vegetables and grocery from shops located near to them and even get the home delivery of the items they have purchased. Shopping fruits, vegetables and grocery is just an example. You can buy or sell almost anything that is available locally. Why to wait for more than a day for your items to get delivered. Now customers can get items delivered same day. When people buy from shops located near to them they can visit the shop and resolve their issue in case their is any problem. This builds more trust between the customers and shop owners. More Trustworthy and Quicker Delivery are the two best advantages of buying from shops located near to you. Now you can build your own app based local marketplace with very low investment. Open Source technology can help save your financial investment that you require to start your business. It can also help you save your time to setup your own marketplace.